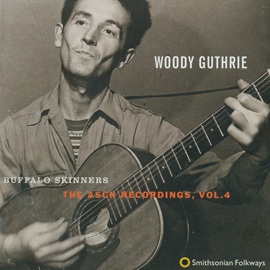 In honor of the Woody Guthrie Centennial, Smithsonian Folkways presents an in-depth commemorative collection of songs, photos and essays on one of America’s most treasured 20th-century icons. 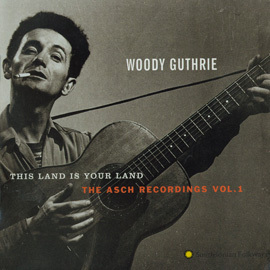 Woody at 100: The Woody Guthrie Centennial Collection is a 150-page large-format book with 3 CDs containing 57 tracks, including Woody’s most important recordings such as the complete version of “This Land Is Your Land,” “Pretty Boy Floyd,” “I Ain’t Got No Home in This World Anymore,” and “Riding in My Car.” The set also contains 21 previously unreleased performances and six never-before-heard original songs, including Woody’s first knownand recently discoveredrecordings from 1939. Richly illustrated with photos, artifacts and Woody’s visual art and lyricsplus extensive essays on Guthrie and his songsWoody at 100 commemorates and displays the genius of one of the greatest songwriters, musicians and visual artists of the 20th century. 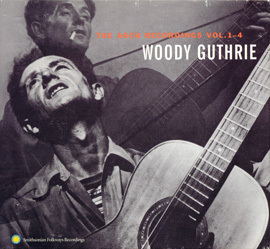 Four of the unreleased performances, including original songs “Skid Row Serenade” and “Them Big City Ways,” are Woody’s earliest known recordings, made in 1939 while he was working for KFVD radio station in Los Angeles. The set also includes a medley performed in 1940 on Lead Belly’s WNYC radio show. 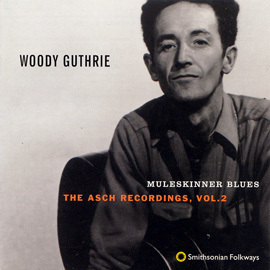 The other four unreleased original songs are “Trouble on the Waters” and “Normandy Was Her Name” from a live radio broadcast and “Reckless Talk” and “Goodnight Little Cathy” discovered in the Folkways Records archives. The book offers an extensive biography of the artist and background information on each track. 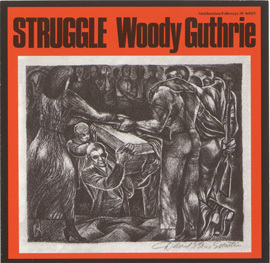 Woodrow Wilson “Woody” Guthrie (1912-1967) wrote songs that became the soundtrack of an era and permanent fixtures of American identity. His early Dust Bowl ballads, along with more than 3,000 work songs, union and labor songs, political and philosophical songs, anti-war songs, anti-Nazi songs, love songs and children’s songs, marked the pulse of hard-hit people in times of economic depression and war. Many have embraced “This Land Is Your Land” as America's second national anthem. Woody was ordinary, yet extraordinarya traveler, itinerant worker, radio performer, military enlistee, thinking man, gifted visual artist, a husband and father, and prolific writer who left his mark on music, culture and politics.